The very first time I came across Janelle Monae, she was performing a tribute to Prince, who was just about to get a lifetime achievement award from BET. As I noted back then, he visibly detested the entire event (and, to be fair, Alicia Keys' performance of Adore was about as exciting as a slumber party at Ed Sheeran's house). Except, that is, for Janelle's loop-de-loop "somebody should really me in a straight jacket" rendition of Let's Go Crazy, which raised a brief but genuine Paisley smile. Clearly, The Purple Prince recognised a kindred spirit, and he's been keeping tabs on Monae ever since. She was the support act for his Welcome 2 Chicago dates last year, and he reportedly returned the favour by duetting on her album. 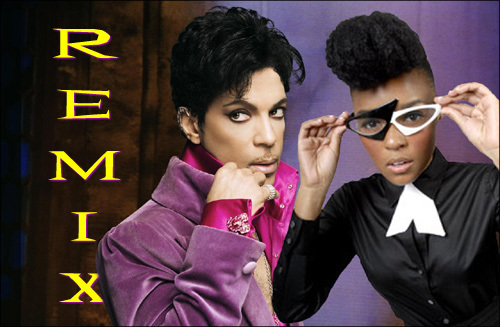 We won't get to hear that until September - but in the meantime, Prince has remixed Janelle's recent single Q.U.E.E.N. - and he's made a pretty good job of it, too. Sure, it's the same turgid drum beat he's been using since Emancipation, but the rump-shaking booty-quaking head-gyrating funk-making groove is solid Minneapolis gold. Pinboard says it was first played during Prince's 3rdeye TV stream a few days back. They've isolated it and bunged it up on Soundcloud (hence the rapid fade-out at the end). Expect it to last about 24 hours before Prince's legal team rip it down like bad wallpaper.